Translate multiple documents with one click. Details: Place a set of documents in a folder, select the folder, and Translate Pro will translate the entire set while you work on other projects. Create new dictionaries with your own terms and translations. Details: Quickly and easily add words or translations not already in the main dictionaries. 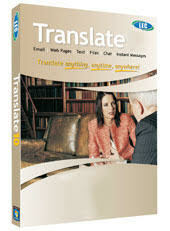 This allows you to increase the accuracy of translations and create a dictionary tailored to your needs. Greater speed and accuracy Details: Improvements have been made to all translation engine dictionaries and grammars resulting in better translations than ever before. Speech-to-text Details: Integration of Microsoft’s speech recognition for English, German, French, Spanish, Japanese, and Chinese when running under Vista. English, Chinese, and Japanese speech recognition is supported under XP. Translate your speech. Control translation applications with your voice. Text-to-Speech Details: for Dutch, English, French, German, Italian, Japanese, Korean, Portuguese, Russian and Spanish. Translate Selection Details: Select any text and its translation appears next to it. Text Capture Details: Import text to LogoTrans from any program. No need to cut and paste: just click or draw a rectangle around the text you want to import. Simply scan PDFs, documents or photos to your computer and drop them onto FileTrans for one-step translation. FileTrans translate files in all common image formats including pdf, bmp, dcx, djvu, djv, gif, jb2, jfif, jpg, jpeg, jp2, jpc, pcx, png, tif, and tiff. With Translate Pro, you also get an introductory subscription to Translate DotNet, with its easy-to-use desktop toolbar. You also get a subscription to TranslateToGo, which is our browser-based service. Our subscription services give you online access to all the languages that LEC supports— more than 300 language pairs. After your initial subscription expires, you may resubscribe to one or more language pairs for as little as $5 per month. You do not need to resubscribe to continue to use Translate Pro from your desktop.